Mobile apps have ‘reformed’ us in more ways than we can imagine. Let’s think about our daily need to motivate and push ourselves into action. Thanks to the glut of motivational apps on the Android market, goading yourself into action is now just a pocket away. Inspiration and motivation comes to each of us in many forms. For some it could like in words of wisdom, for others it could lie in uplifting images, and for a few it could be in a germ of an idea. The Android universe has an app for most of our inspirational needs, so let’s check out the Android Market and see one of the best motivational Android apps that can give us the daily dose of motivation that we need when we flag off. What is Daily Motivational Quotes? If you ever feel uninspired or maybe the realities of everyday life are starting to wear you down Daily Motivational Quotes has got you covered. 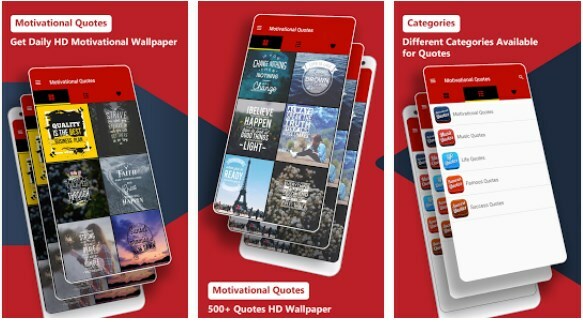 This amazing quotes app was released on the Android platform a while ago, and since then it’s been getting so much positive reviews and ratings. Read about our experience with the app. Daily Motivational Quotes provides with carefully selected inspirational and motivational quotes for users of any age. It gave us an opportunity to read tons of quotes on a daily basis, quotes and sayings from philosophers, writers and other great minds. We liked the whole organization of it – it has thousands of quotes packed in more than 100 categories, from Motivational Quotes, to Music Quotes, Life Quotes, Famous Quotes, Success Quotes, etc. Each quote image can be downloaded on your device and put as a background. This way we can all personalize our phones and tablets with the ones we like the most. In addition, users can easily share what they like with friends and family, save the ones they like the most in the list of Favorites, enjoy a simple and neat user interface, and so on. After all, you have to check the app for yourself. You can download Daily Motivational Quotes by clicking the Google Play Store link below.